Well it is the end to another productive year on the farm. Commodity prices remain strong and I can imagine that despite some mixed results on harvest many farmers would be happy with the year and particularly prices currently being offered for wool, lamb and beef. 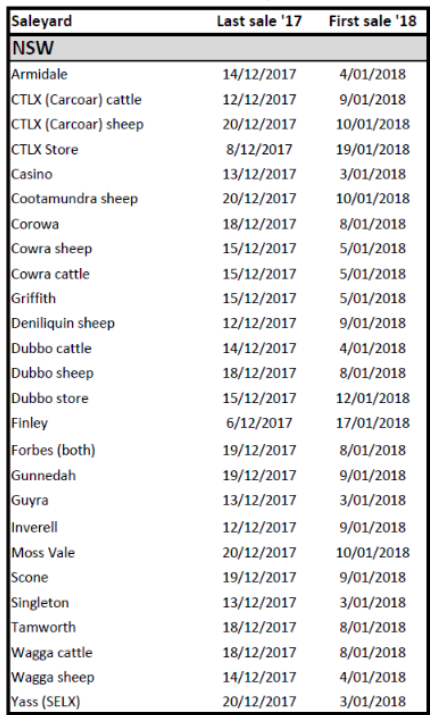 2018 seems set to start in the way 2017 finished on lamb and for beef we sense processors and feedlots trying to keep a lid on prices. For kill cattle we feel that there are a good number of cattle to come forward with solid weights in the next few months. In recent weeks we have seen the feeder cattle price remain strong and prices for kill cattle soften ( in southern markets an Angus steer at 450kgs could be purchased for $3.10/kg for the feedlot and the same steer with another 100kgs will be virtually the same total dollar value). With increased grain prices looking somewhat permanent for feedlots we expect the pinch to be gradually shifted from the feedlotters back into a softening of feeder cattle prices. Have a great festive season and look forward to speaking in 2018. Bull sale prices - the average price for Angus bulls sold at auction increased by $300 on 2016 to $7630. With an extra near 900 bulls going under the hammer. 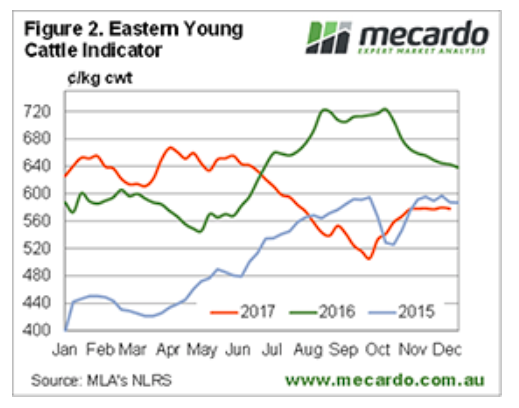 Increase in carcases weights - for the first 10 months of 2017, the average male carcase weight was up by 10kg year-on-year to a record of 329kg. Slaughter cattle - supplies improved from mid-2017 and are forecast to improve more in 2018. Beyond Meat burgers are sold in more than 5000 stores across the US. Beef production is set to increase by 1.3 million tonnes in 2018. 2018 will see a power change with beef importers being in a more favourable position. China's import demand will increase to 800,000 tonnes of beef. Beef exports will increase by 7% in the US with their cattle herd expanding again for the third consecutive year. Low interest rates have been capitalised into property prices. In housing in particular this is likely to mean slow growth in housing prices for some years. 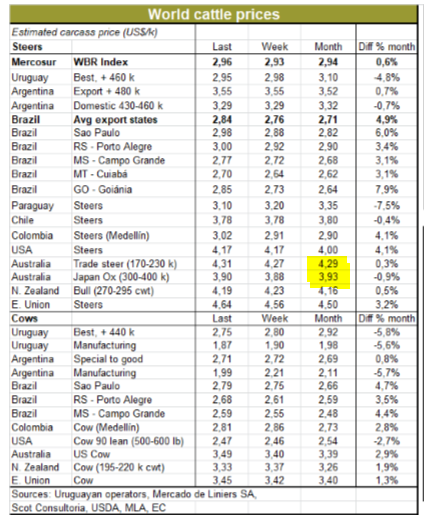 BRAZIL BEEF IMPORTS INTO AUSTRALIA? An ABIEC report suggests that 55 tonnes of fresh beef was imported from Brazil into Australia during 2017. Beef from Brazil is not permitted into Australia because of foot and mouth disease and BSE disease risks. But cooked, processed products containing Brazilian beef are. 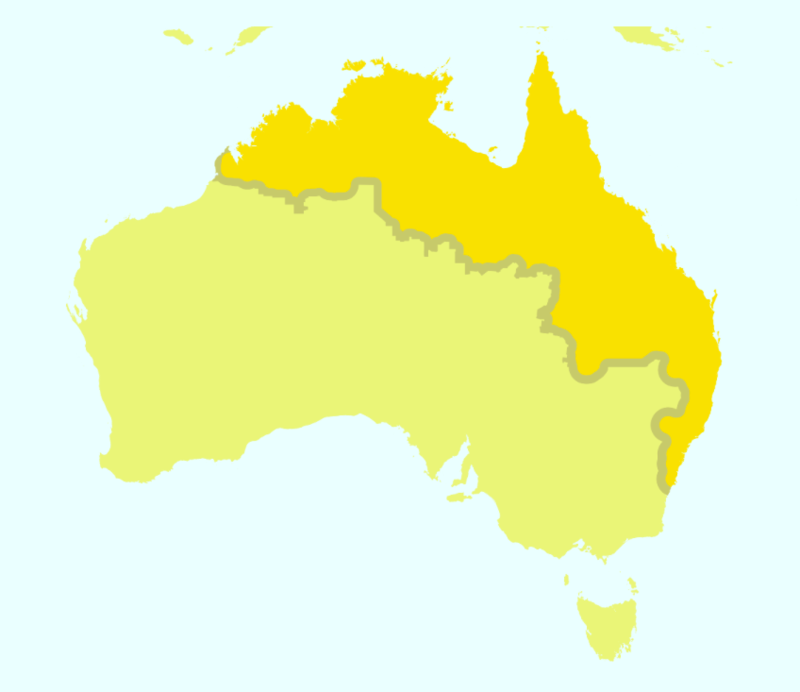 The Australian Department of Agriculture has no record of any imports from Brazil. Finished cattle have realigned with the US market. 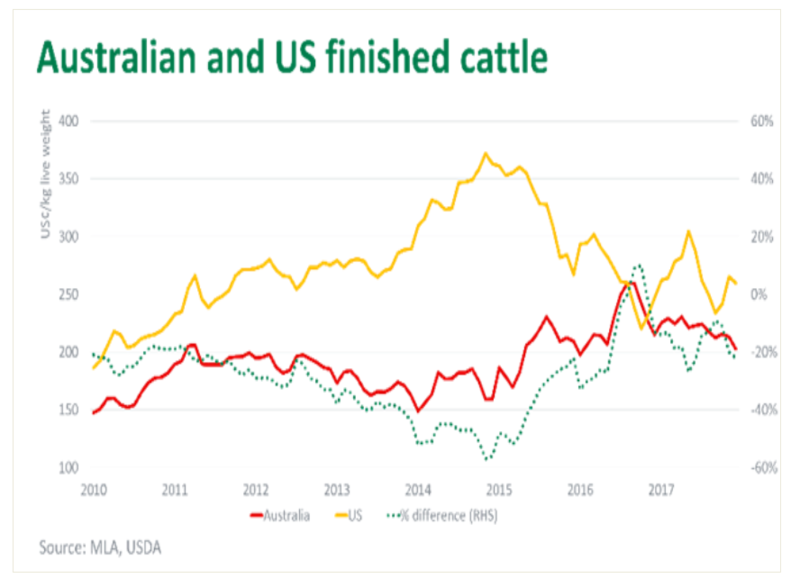 The relative price difference between finished cattle in both countries in USD/AUD has returned to a 20% discount. It was a 57% discount at the height of prices in the US and the drought in Queensland. The USA is Australia's main competitor but Brazil has recently been doing more business into the Asian markets. Brazil's success has come largely from favourable currency movements and the growth in Australian cattle prices. 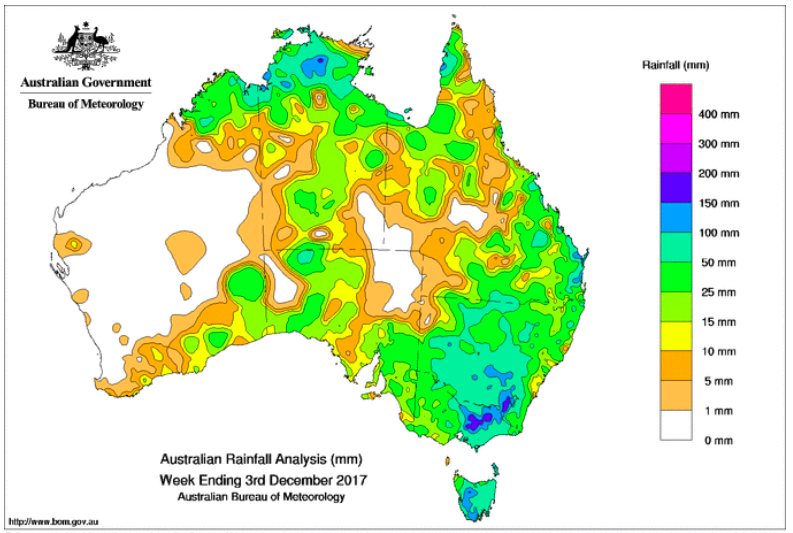 The first week of December brought some BIG rain. Boorowa received around 100mm+ with a nice green tinge put back onto the paddocks. The last time we saw a rain event like this was back in 2010. A temporary blue tongue virus (BTV) zone has been established in northern Victoria and extends into southern NSW. The action was taken as a precaution in response to the detection of BTV antibodies during pre-export testing in Victorian-bred cattle. Copyright © 2017 Kenny’s Creek Angus, All rights reserved.